If you plan to use floating licenses for some or all of your computers you must download and install the floating license server for the add-in. Each C-Cubed add-in that supports floating licenses uses a separate floating license server. Using floating licenses may reduce the number of licenses required for your work group. You can combine floating and fixed licenses for any C-Cubed add-in. For example, you could purchase ten (10) floating licenses for your engineering workgroup, and a three (3) license pack of fixed licenses to be installed on laptop machines that may not always be connected to your network. You install the floating license server application on a computer that is accessible to a local group of users. We do not support serving licenses across WANs, domains, converting floating licenses to fixed licenses (unless you also have a local license key), or any other enterprise networking support. The floating license server does not use the same technology as floating licenses for Autodesk products. For computers that are using a floating license, the add-in obtains a license from the floating license server when the add-in is first used. The license is released when Autodesk Inventor is closed, making it available to another user. If all available licenses have been assigned from the server, no other users will be able to obtain a license until one or more licenses have been released by current users. You must have Administrator permissions on the computer where you install the floating license server. See below for installing the license server as an administrator. Floating license server applications do not include an evaluation period. You must activate the floating license server license before you can obtain licenses from it. Download the zip file with the floating license server for the add-in. Unzip the files to a folder on the computer that will act as the floating license server. Open a Command Prompt window with the "Run as Administrator" option. In the Command Propmpt window, enter the full path to the _Install_[add-in name]_Service.bat file. The installation progress of the license service is shown in the command prompt window. Confirm that the license server was successfully installed. The Install License dialog is displayed once the Windows service is successfully installed. Copy and paste the floating license key you received in an email after purchasing the add-in. Click Activate. If successful, the License Status will change to License Installed. 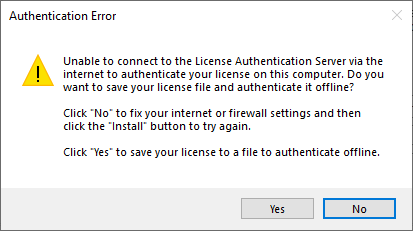 If there is an issue authenticating your license, an explanation message is displayed. Click Done to complete the activation. If the license activation was successful, a confirmation message indicates the number of floating licenses available from the server. If the license activation is not successful, a confirmation message is shown indicating zero (0) licenses were installed. If you see this message, double-click the _Uninstall_[add-in name]_Service.bat file to ensure the floating license server is uninstalled. If you do not have an active internet connection you can still activate the license. See Manual Activation of a Floating License Server License below for more information. On activation, a license file is saved to the same folder on the server. Two log files that document the installation are also saved here. Do not move the license file (.lic) from this folder. Optonally, you can save a copy of the license file to another location. In the activation dialog box, click Save License. Save the backup with a descriptive name identifying the computer where it is used. You can also manually copy the license file described above to a backup location. If the C-Cubed license activation server cannot be reached, an Authentication Error message is displayed. Typically this is caused by a firewall or proxy server on your system preventing access to the license server. Click Yes to save the license file for manual activation. Save the file using a descriptive name. In the Install License dialog box, click Done. A message is displayed indicating zero (0) floating licenses are installed. In the folder, double-click the _Uninstall_[add-in name]_Service.bat file. Wait for the command window to close. We will activate the license and return the file to you. When you receive the activated license, follow the intallation steps outlined above. Browse to and open the activated license file. Click Done.